Dominant TF: 60 mins & Daily (low intraday time frames too). Weekly influence declining. Market direction: congestion to down initially. Overall trend is still up, but support must be found first. 60mins: Congestion to down, but probably at a slow pace. It is interesting to see that the 828 pivot level is now a new lower resistance level. AdStoK and Entropy point lower toward support levels around 820 first, but much stronger at 813. Significance level is high so we probably just have to follow the trend until AdStoK lines cross. Daily: Congestion to down at first. Overall direction unchanged yet but new support will have to be found. AdStoK is weaker and lines are crossing, indicating a definite slowdown. The red bar confirms also the diagnostic. We could certainly look for support between 808 (Fib) and 812 (MM) in the next few days. The high volatility environment seems to accelerate movements in either direction, however Entropy is still fairly high so this down move should be fairly controlled. No reason just yet to believe it will go lower than pivot level. It was clear RUT would hit 851 (highs + Fib) but what is now coming next? AdStoK and Entropy do not point lower, so one should not panic just yet. RUT is likely to hold or even possibly go higher. Strong MM resistance is still 875. Market direction: Congestion. Upward bias still valid overall despite some profit taking. 60mins: Congestion to mildly down. Erosion of SPY should continue, until support is truly found, first at 153.13, but possibly lower. Since the gradient is moderate, 153 is indeed more likely than 150 which seems much stronger though. 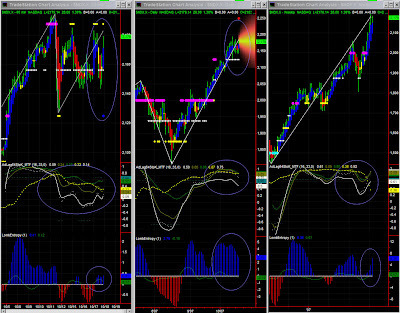 Note that lower time frames have high significance level and indicate an upward bias at first. Check 1562 as quite a strong resistance level on ES futures. Daily: Profit taking until support is found. AdStoK is so overbought with a white line declining, bars turning red, but Entropy is still holding fairly well. This is not indicative of any strong retracement in the near term, so profit taking should continue at a slow pace, possibly to 150 which would be tested for support and is a Fib PR1 level. The Swing indicator is up, but the key swing price level is still close at this time frame, so the indicator could turn around again. For the time being, everything points upward. We can however see some divergence in AdStoK and a very low significance level at this time frame (divergence? ), so this is at best only a background information at the moment, and one should certainly focus on lower time frames (15mins and daily). 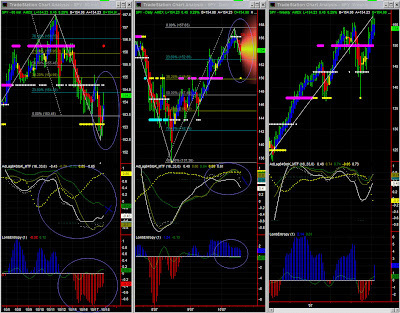 Market direction: Congestion but upward bias still valid (Daily). Note: A variation to the AdStoK white line is plotted (test). It provide a slightly higher memory effect in the indicator. 60mins: Congestion with an upward bias. The same trading range is expected. Congestion is expressed with relation to the high volatility environment we have had for a few weeks. The market may try and test 2187 again. It has been the stall level after the strong bull run we had for a couple of months, and constitutes a test level. Levels to watch: 2188 pivot level at this time frame, but lower time frames do provide MUCH higher significance level and trading opportunities. Daily: Congestion - Upward bias is still technically there but NDX is very overbought, so lower time frames must be watched carefully. AdStoK and Entropy are now showing more signs of weakness. There is however substantial accumulated energy in Entropy that one cannot imagine a serious retracement right now, but one could certainly have a pause with some congestion and profit taking. This high volatility environment can also obviously accelerate movements in either direction, but that would take a few days to materialize. Note: the new AdStoK White Line variation is higher, hence down-plays the effect of the current profit taking event. Current congestion in lower time frames can slow down or stall the upward bias we still have. 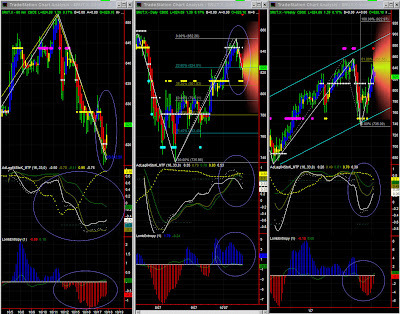 Note that significance level on this time frame is falling, due to indicator divergence.